My kids went surfing for the first time this summer and loved it. Since it’s freezing outside I wanted them to have a way to practice indoors, so I made them a balance board as a holiday gift. This balance board is a super simple project and it’s a really fun way for them to stay active in the cold winter months! All you need is some scrap plywood and some PVC pipe, but I decided to make my life a bit difficult and add a walnut inlay. Doing the inlay is totally not necessary but it was a fun challenge to figure out. Scroll down below for the free printable template and for the full build video! To save on paper the template is only half the board, so you can use it for both sides. I lined up the layout lines and taped it up. Then staying as close to the line as possible, I cut out the template. I placed the template on the plywood and traced the outside making sure to also trace the center line. After tracing one side, I flipped the template over along the center line to complete the shape on the other half. After the board was traced, I cut it out using the DeWalt 20-Volt MAX Lithium-Ion Brushless Cordless Jigsaw. I used to say the jigsaw was my least favorite tool, but I really enjoyed using this one! The brushless motor is super powerful and it was effortless to use. This was by by far the most accurate cut I have ever made using the jigsaw, I barely needed to sand the edges smooth. There are a lot of pretty cool features on this saw, one of my favorites in the all metal lever action blade clamp. This made installing the blade a breeze. Another cool feature is being able to put a bevel on the shoe. There are marks for 0, 15 and 30 degrees with a positive stop for 45 degrees. I’m a huge fan of positive stops, the less time I waste setting up a tool, the better. Now that I have this awesome jigsaw I’ll probably be incorporating more jigsaw work into my projects! I found the center of the board and then made 45 degree lines spaced 5 -1/2” from their points to prepare for the router. Then using the router edge guide I posted a few weeks back I just routed away on those lines! This router edge guide works by referencing the center of the router, so it really came in handy with these inlays. As you can see in the picture above winter has set in… I wasn’t aware of this, but cold weather can really negatively affect your outdoor locks. The lock on the back door to my house was not working and I thought I needed to replace the lock. 3-IN-ONE sent me a can of their Lock Dry Lube to see if it would fix the problem. I really had no idea if it was actually going to work, but after 2 sprays the lock was working like new again! I tested this out on Instagram and you can see how it fixed the lock in real time. I am so glad I kept pushing off replacing the lock because this was a much simpler and less expensive fix! 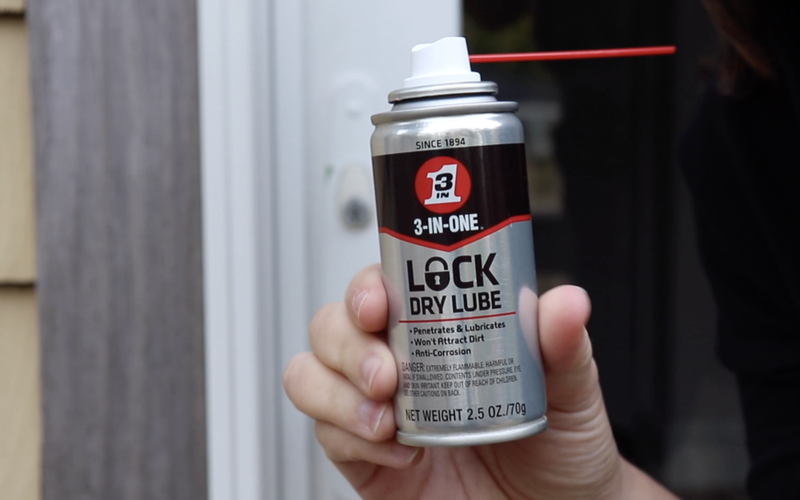 Protect your locks this winter with some Lock Dry Lube, you can pick up a can at The Home Depot. Now back to the build! Router bits leave rounded corners since they are round, so I squared up the corners with a chisel to prepare the grooves for the walnut. I cut the grooves in the plywood to be about 1/16 deep, so I used a thin ripping jig to cut the walnut to that thickness. Then I ripped them to 1/2” wide at the table saw since I used a 1/2” router bit to make the grooves. All the points of the pattern meet at a 45 degree angle. I used this shop made miter box to safely cut one 45 degree angle on one end. Then I placed the walnut strip into the groove and trimmed off the end. I repeated this process until all the grooves were filled. Then I glued them in place using wood glue. After the glue dried, I sanded everything flush using the DeWalt 20-Volt Max Lithium-Ion Cordless Brushless 5 in. Random Orbit Sander. This is a powerful little sander and I love the flexibility of not having a cord. If you have other DeWalt 20 Volt batteries already this is a great addition to the arsenal. It’s really lightweight and feels comfortable to hold for long periods of time. If you don’t already have DeWalt batteries, but are looking to get on the platform the DEWALT 20-Volt MAX XR Lithium-Ion Premium Battery Pack is a good place to start. It comes with two 4.0AH batteries that you can charge at the same time since there are two ports. You can also charge your phone or anything else that uses a USB charger. I love having the capability to charge my phone on this charger since I love to listen to music while I build and it eats up my battery life! It also charges pretty quickly, in 95 minutes or less so you can keep in building! To ease all the edges I used a round-over bit in my trim router. This could also be done by sanding. In order to safely use the balance board, there needs to be stops on the underside so the roller doesn’t completely slip out from under you. I cut up some scraps into 2” long pieces at the table saw for the stops. I don’t think it matters how wide or thick they are, I just used what I had. To mark the locations on the board for the stops I used the printable template to find the center line, then marked 10” down from the nose and tail. Then on that 10” marker I measured 5.5” from the center line of the board so the stops would be near the edge of the sides. I glued the stopper blocks down and used a brad nailer to hold them in place while the glue dried. Making the stops like this enables you to use the roller in both directions. You can run the roller parallel or perpendicular to the board. The wood and PVC are both slick, so I needed to add some sort of traction. I considered adding duct tape to the roller but decided to add some rubber shelf liner to the underside of the board instead. I cut it to size then used double sided carpet tape to adhere it to the plywood and I’m really happy with the traction this provides. For the roller I just used a 3” piece of PVC pipe at 2’ long and painted it to make it pretty. If you are looking for more of a challenge you can totally use 4” PVC but I felt it would be too high off the ground for my kids. Also, I only used a 2’ long piece, but if you are looking to practice walking on your balance board, you should probably use a 3’ long piece so it runs almost the whole length of the board. I didn’t put any grip tape on the top because I didn’t want to cover my inlay work (ha!) but I do think adding some skateboard grip tape to the top would be a good idea. This project was so fun to make and my kids are really enjoying it so far! They don’t even realize they are getting a good work out! Ha! I think I am actually enjoying it more than they are though!